PhotoRec is a file recovery software for various operating systems including Microsoft Windows but also Linux and Mac OS X. 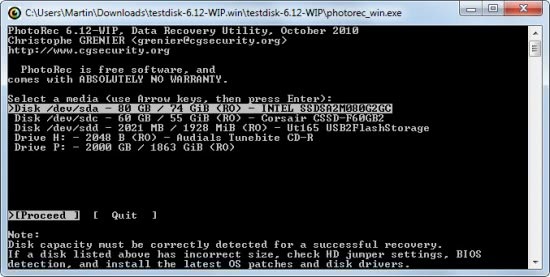 The free program ships with Testdisk, a well known program for recovering lost partitions on a computer system. The name would suggest that it can only be used to recovery digital pictures but that is not the case. 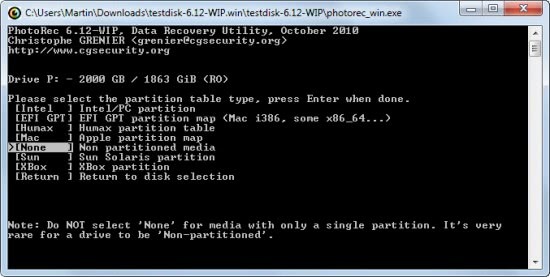 PhotoRec can recovery and kind of data on a drive providing that it has not been overwritten yet. Windows users need to start photorec-win.exe after unpacking the application to a local directory. That makes PhotoRec a portable application on Windows. The program displays a list of devices that the application can scan for deleted data. PhotoRec will only display internal hard drives if the program is started with elevated rights (right-click the program and selected run as administrator to do that). The program supports a variety of file systems including FAT, NTFS, EXT2/EXT3 and HFS+. A device can be selected with the arrow keys and pressing enter after the selection has been made. It is then necessary to select a partition type on the next screen. This may pose troubles for inexperienced computer users. The default one is usually correct and should be selected as PhotoRec auto-detects the partition table type. The source partition has to be selected in the next step, and then the file system of that partition. The default values are usually correct. Finally, the destination for recovered files needs to be selected. Users can configure some options to configure the file types that should be recovered or if corrupted or partial files should be recovered. The analysis of the file system can take a while depending on the size of the disk It is usually not a good idea to run the program on a large disk, as there is no option to select specific file types for recovery. PhotoRec will recover all files that it finds to the selected destination directory. This makes it ideal for usb sticks, memory cards and other devices with little storage space. PhotoRec is available for download at the CGSecurity website. I use Disk Drill for data recovery on my Mac. It’s free.